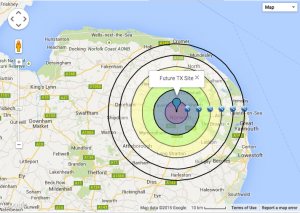 Future Digital Norfolk, has been awarded a nine month trial licence to operate DAB digital radio broadcast transmissions serving Norwich and the surrounding areas. A single multiplex transmitter operating from the same site as used by Future Radio for it’s FM (107.8MHz) transmissions will be used, operating on the 9A DAB block of frequencies. 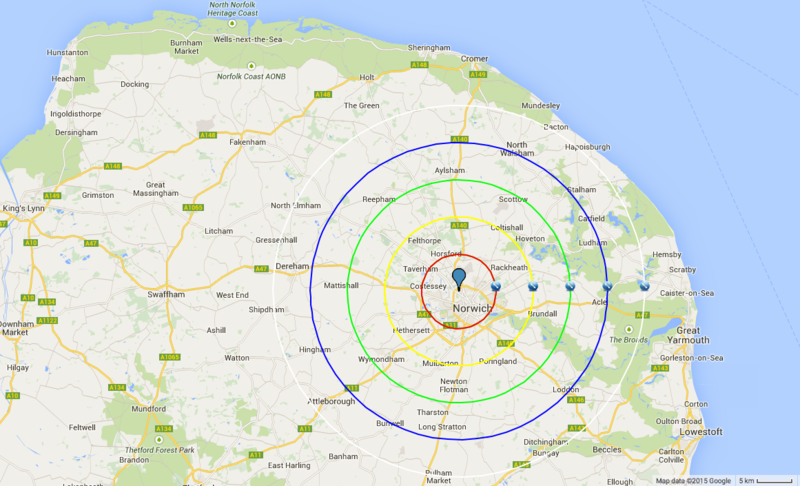 A copy of our public application to operate a small-scale DAB trial multiplex in Norwich is available here. 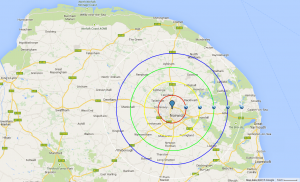 The Ofcom map showing the predicted coverage of our small-scale DAB trial multiplex for Norwich is no longer available (due to copyright reasons). However an alternative version is available here. 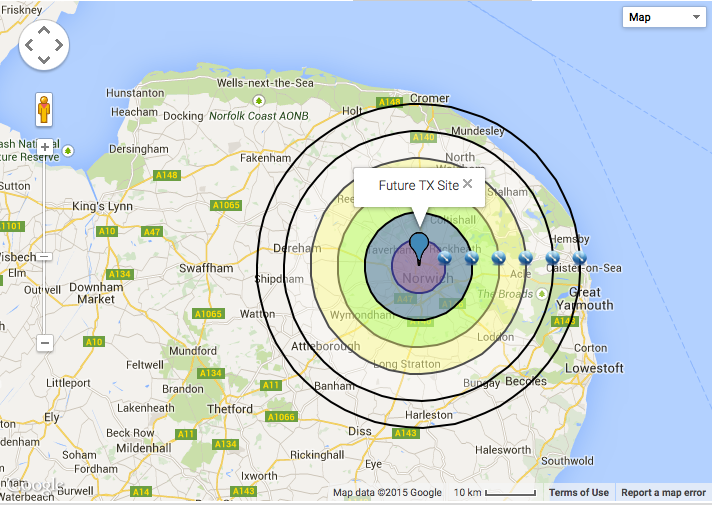 For comparison, a map showing Future Radio’s current predicted FM coverage of Norwich (on 107.8 MHz since 2010) is available here. A map showing Future Radio’s original predicted FM coverage of West Central Norwich (on 96.9 MHz, 2007 & 2010) is no longer available (copyright again!). Ofcom’s report concerning its original small-scale DAB Test and Development trial transmissions in Brighton is avalable here. 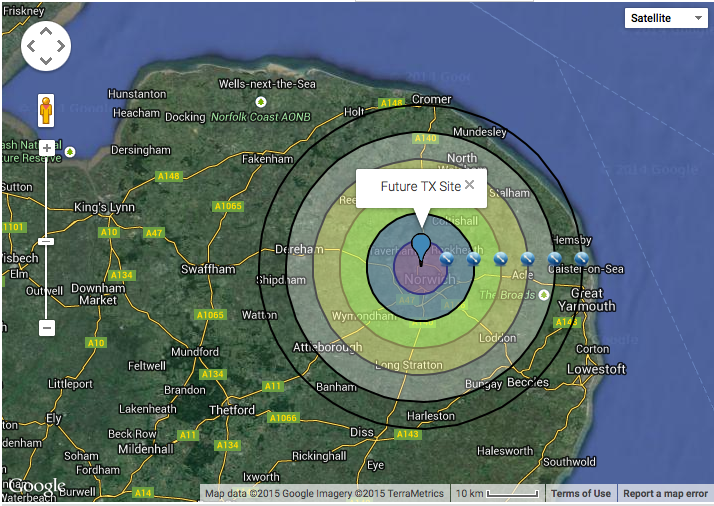 The images below show radii from the Future Radio / Future Digital Norfolk Transmitter Site in NW Norwich. The coverage achievable from this site is dependent upon the frequency allocated, the design of the antenna system used and the radiated power level used. The images below show radii in multiples of five kilometres from the transmitter site. Each assumes an omni-directional radiation pattern from the antenna system and does not take into account attenuation impacts of terrain features / man-made clutter (buildings etc.). Ofcom Report on Brighton Small-Scale DAB Trials, 2012 / 2013. Ofcom Consultation concerning Small Scale DAB Trials, 2014. Ofcom Statement concerning Small Scale DAB Trials, 2015. [Added 14th July 2015]. Ofcom Statement concerning Small Scale DAB Awards. 2015. [Added 14th July 2015]. Small Scale DAB Trials - Final Report September 2017. [Added 14th August 2017]. (Predicted Coverage Maps of Small Scale DAB Trial Locationss) can be found in the above Final Report. Broadcasting Radio Multiplex Services Act, 2017. [Added 14th August 2017]. Creative Commons 4.0 | Other Rights Acknowledged.